If you read other articles in this issue carefully, you might begin to wonder if animal life is going through a hushed up identity crisis: Hummingbirds and canaries have finally come out as dinosaurs (Angielczyck 2009; Chiappe 2009). Despite lacking the four feet of tetrapods (tetra = four, pod = foot), snakes and whales have been embraced by this group (Clack 2009). Elephants are simply confused; they may or may not be ungulates (Prothero 2009). This taxonomic soul searching and the resulting strange bedfellows (e.g., lumping budgies with brachiosaurus) do not, of course, stem from long therapy sessions, but from a quiet revolution gripping biology: phylogenetics. Phylogenetics is the area of biology that deals with evolutionary relationships among organisms. In the past few decades, technological advances have produced a flood of genetic data, computing power has exploded, and scientists have developed new mathematical algorithms for building phylogenies—or evolutionary trees. As a result, biologists have been increasingly able to reconstruct the evolutionary histories of groups of organisms. We can now draw the family trees of close-knit groups, like Darwin’s finches (Petren et al. 1999), and sketch the deepest lines of descent that connect animals, plants, fungi, and bacteria (Ciccarelli et al. 2006; Figs. 1 and 2). The widespread availability of evolutionary trees is reshaping how biologists ask and answer biological questions. For a review of how to read and understand evolutionary trees, see Gregory (2009). Phylogenies have even invaded what is, perhaps, the most foundational area of biology: taxonomy—how we classify and name life forms. This is the reason that elephants are left on the fence about their identity, while birds have landed in the dinosaur camp, and snakes can boast the paradoxical title of tetrapod. Biologists have changed the fundamental ways that they think about classification. The Linnaean system of classification is how most of us learned about biodiversity, and it remains deeply embedded in biology textbooks today. Memorizing the Linnaean ranks of kingdom, phylum, class, order, family, genus, and species, was—and in many classrooms, still is—a rite of passage en route to more advanced material. But should it be? This system was created in the 1700s, long before scientists understood that life evolves. Today, biologists have moved away from the aspect of traditional Linnaean classification that groups organisms according to similarity of specific characteristics or overall similarity. Instead, biologists are adopting a system of classification based on phylogenetics, which reflects organisms’ evolutionary history. In another article in this issue, Angielczyck (2009) provides an introduction to phylogenetic classification. Here, we explore how the new system works and why biologists are bothering to make the switch. As opposed to naming phyla and families, phylogenetic classification only gives names to clades—groupings that include an ancestor and all the organisms (whether living or extinct) descended from that ancestor. A clade may include hundreds of thousands of species or just one. Using a phylogeny, it is easy to tell if a group of lineages forms a clade. Imagine clipping a single branch off the tree. All of the organisms on that branch make up a clade (Fig. 3). If any organisms that spring from that branch are excluded from the grouping, it does not form a clade. A quick glance at the phylogeny of tetrapods (Fig. 4) makes it clear why phylogenetic classification leads us to view birds as dinosaurs. Since birds evolved from dinosaurs, there is just no way to clip a single branch from this tree that includes Triceratops and Tyrannosaurus rex, but excludes birds. In the same way, snakes and whales are tetrapods because they evolved from four-legged tetrapod ancestors. On the other hand, the status of elephants as ungulates is currently uncertain because scientists need to gather more evidence in order to be confident about where the pachyderm lineage connects to the rest of the tree of life. Figure 4 also highlights why the definition of Reptilia that you might have learned in school—a group of cold-blooded, scaly, terrestrial vertebrates made up of turtles, lizards, snakes, and crocodiles—is not a valid grouping according to phylogenetic classification. You cannot snip a branch that includes the traditional reptiles but excludes dinosaurs and birds. So either we cannot use the term reptile as a scientific name or we need to start thinking of birds as reptiles. Biologists have opted for the latter approach. Birds are considered members of the group Reptilia. Clades form a nested hierarchy—that is, they are nested within one another (Fig. 5). For classification purposes, an organism accumulates all the names of all the clades to which it belongs. So, for example, if we work our way backward from the evolutionary twig belonging to the Common Ostrich (Struthio camelus), we see that it first joins the shoot belonging to all ostriches (Struthionidae) and that this shoot springs from the Ratite bird branch (Struthioniformes), which attaches to the bough belonging to all birds (Aves), which is itself just one offshoot of the dinosaur limb (Dinosauria)...and so on, all the way back to the root of the tree of life (Fig. 6). Because the Common Ostrich is in each of these clades, it is given all of these names. It is an ostrich, a ratite, a bird, and a dinosaur. Phylogenetic classification means a shift in the way we think about classification, but it does not mean a radical change in what organisms are actually called. Drosophila, Escherichia coli, T. rex, and most of the other scientific names you have gone to the bother of learning are still the same. At issue is really what we can take away from a name. If two lineages are both in the group Drosophila, we know that biologists have evidence that they are more closely related to one another than either is to flies not in this group. Of course, in some cases, discovering how organisms are actually related means that biologists have had to reconsider the names that are applied to them. For example, 50 years ago, birds were not members of the group Dinosauria, but this has changed now that strong evidence regarding birds’ position on the tree of life has been found and biologists have endorsed phylogenetic classification. As biologists have adopted a phylogenetic basis for taxonomy, many have discovered a frustrating clash with one aspect of Linnaean classification: ranks, or the designation of specific levels corresponding to kingdom, phylum, class, order, family, and genus. On a practical level, this ranked system has been a challenge, causing frequent name changes. Here is why. In traditional Linnaean taxonomy, a group cannot be nested inside another group of the same rank—a genus cannot be a member of another genus, a family cannot be a member of another family, etc. So if, for example, a scientist studying two genera discovers that one genus actually evolved from the other (Fig. 7), the names of the organisms in one of the original genera will have to be changed. Since we are still learning so much about the tree of life, this situation is not uncommon. For example, when three genera of Hawaiian silverswords were found to have evolved from a genus of California plants (Baldwin et al. 1991), it caused a cascade of name changes. For these and other reasons, there is a small but growing movement among biologists to get rid of Linnaean ranks entirely (Withgott 2000). In terms of accurately reflecting evolutionary processes, this makes sense. Evolution has no foresight or overall plan. It is not making any special effort to churn out body plans different enough to be called phyla or to generate a lineage destined to be the fount of a new order. All these ranks—kingdom, phylum, class, order, family, and genus—are simply subjective divisions that humans, beginning with Linnaeus, used to describe biodiversity. Since they were conceived before evolution was, it is not surprising that shoehorning the amazingly diverse products of evolution into Linnaeus’ discrete levels is difficult. Some might wonder why biologists bother grappling with these issues. After all, what is in a name? It is just a word, right? A system of classification can just be a way of naming things, but it usually does more too. The advantage of phylogenetic classification is that it accurately reflects the evolutionary processes that have shaped life. With phylogenetic classification, just knowing what an organism is called can provide lots of useful information about its evolutionary history and the traits it is likely to have. Since all organisms have inherited traits from their evolutionary ancestors, closely related organisms are likely to share many traits. So even if, for example, all we know about a newly discovered plant species is that it is some sort of yew (Taxus), we can already make good guesses about other characteristics it might have—for example, we can guess that it might contain chemicals useful in treating cancer, as some other yews do (Vidensek et al. 1990). One has a longer history than the other. The first representatives of the cat family Felidae probably lived about 30 million years ago (McKenna and Bell 1997), while the common ancestor of modern orchids lived around 80 million years ago (Ramírez et al. 2007). They have different levels of diversity. There are about 40 cat species (Wilson and Reeder 2005) and almost 20,000 orchid species (Judd et al. 2002). They have different degrees of biological differentiation. Many orchids belonging to different genera are able to hybridize. But the same is not true of cats—house cats (belonging to the genus Felis) and lions (belonging to the genus Panthera) cannot form hybrids. There is just no reason to think that any two identically ranked groups are comparable in biologically meaningful ways. Unfortunately, the ranked Linnaean system can easily be misinterpreted as suggesting that they are. This can cause scientists to make unfair comparisons and can have practical implications—for example, regarding conservation choices. This is one reason that some biologists are moving away from Linnaean ranks. Taxonomy does much more than simply provide names for talking about organisms. How we classify life reflects and influences how we think about biodiversity. As phylogenies have become more widely available, biologists have seized upon them, not just as a means of classifying organisms but as a key tool for biological research. Phylogenies depict scientific knowledge—hypotheses regarding evolutionary relationships—but they can also be used to build new scientific knowledge. As described by Angielczyck (2009) in this issue, phylogenies are used in figuring out when and in what order different traits arose—and this can help reveal why and how these traits evolved in the first place. Phylogenies can also help us learn about basic evolutionary processes—for example, what sorts of events trigger adaptive radiations (e.g., hybridization; Seehausen 2004). Phylogenies are even useful at a variety of practical levels—from figuring out the source of a disease that has just begun infecting humans (e.g., severe acute respiratory syndrome; Li et al. 2005) to setting conservation priorities (e.g., for plant species; Cadotte et al. 2008). Using trees for biological classification is just the tip of the iceberg and reflects much deeper changes in how biological investigations are undertaken. By helping students understand the role of phylogenetics in classification, we can prepare them to understand modern biological research and encourage them to view all of biology through the lens of evolution. ○ Using trees to understand plants. Appearances can be deceiving. Here, we have seen that biologists classify organisms based on their evolutionary history, not on similarity in appearance. That means that when we get new information about how organisms are related, it can affect how they are classified—especially if the group has experienced a lot of convergent evolution. This research profile follows biologist Chelsea Specht as she investigates a lineage of tropical ginger plants and reveals some surprises in their phylogeny! Her discoveries prompted the reclassification of several groups, clarified why some distantly related groups look remarkably similar, and pointed to a tantalizing explanation for why some groups speciate like mad and others do not. 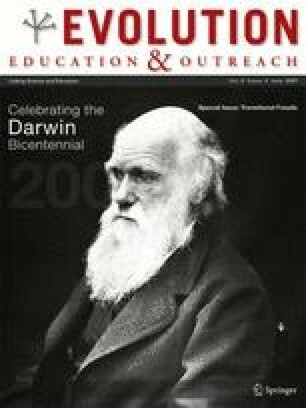 Read it at: http://evolution.berkeley.edu/evolibrary/article/specht_01. ○ The new shrew that’s not—not a shrew, that is. While thousands of insect species are discovered each year, mammal species not yet in the scientific record are a rarity—so when scientists discovered a new elephant shrew species in 2008, it was big news. Do not be misled, however, by the common name of this fuzzy, squirrel-sized critter. It is neither an elephant nor a shrew. This short article explains how the classification of elephant shrews has changed as we have learned more about their evolutionary history: http://evolution.berkeley.edu/evolibrary/news/080301_elephantshrew. The topic of phylogenetic classification provides you with the opportunity to demonstrate to students just how fundamental evolutionary theory is to modern biology. It is so important that it’s at the heart of how biologists organize the living world! Do not miss out on this opportunity by just focusing on Linnaean ranks. Students need to know that the guiding principle of modern classification has to do with common ancestry and the nested hierarchy formed by the tree of life. Students should understand that while the Linnaean system is historically important, there is nothing “natural” about phyla, orders, and families—they are just names for more or less encompassing clades. Memorizing the ranks is much less important than understanding the concepts of clades and common ancestry. ○ Apes without humans. Humans and chimpanzees shared a common ancestor about six million years ago. This was after the human/chimp ancestor branched off from the lineage that led to gorillas and long after the human/chimp/gorilla line branched off from the line that led to orangutans. So, together, humans, chimps, gorillas, and orangutans form a clade. There is no way to clip a single branch from the tree of life that includes chimps, gorillas, and orangutans but excludes us. Humans are not just descended from apes; in a biological sense, we are apes! ○ Defining a reptile. Reptiles are commonly thought of as cold-blooded land-dwelling vertebrates with scales. However, as explained above, in a biological context, the group Reptilia includes organisms that are not cold-blooded or land-dwelling and that do not have traditional scales. If you want to present reptiles in their modern biological context (which includes birds! ), it is best to define them in a phylogenetic context and then look at how these traits evolved within the clade. ○ Warm-blooded and cold-blooded classifications. Many textbooks group animals in terms of their body temperatures relative to their surroundings. “Birds and mammals” is a common example. There’s nothing wrong with talking about body temperature—it is actually a fascinating topic since this trait has undergone convergent evolution—but it can be misleading to classify organisms on this basis. ○ Two or five kingdoms. Fifty years ago, all living things were considered to be either plants or animals. This required shoehorning fungi into the plant kingdom and classifying ciliated protists as animals. A few decades later, some scientists felt that a five-kingdom scheme would be more appropriate. Most recently, genetic research has revealed that the most basic splits in the tree of life carve the biological world into three large clades (called domains): the Bacteria, the Archaea, and the Eukaryotes. Many textbooks, however, still focus on a five- or six-kingdom scheme. It is important to recognize that these domains, not the kingdoms, are the most ancient groupings in the tree of life and reflect fundamental biological differences among cell types. Animal, plant, and fungus cells actually have tons in common when you compare them to Archaea! ○ Classifying human-made objects. Many teachers (rightfully!) enthused about phylogenetics engage their students in an activity where students come up with a classification scheme or dichotomous key for sorting hardware or some other set of human-made objects. This sort of activity is understandably appealing, but is problematic in several ways: (1) Scientists do not classify organisms into groups on the basis of single characters. Many different characters are used to build phylogenies, and organisms are classified on the basis of the phylogeny. Single characters can be useful for figuring out where on the tree an organism is likely to fall—but the real reason that an organism is classified as one thing and not another has to do with common ancestry, not single characters. The difference is a bit like using a fever to diagnose the flu. Body temperature is a useful indicator of what sort of illness one has—but the real reason for the illness is infection with a particular pathogen. If students came away from a health lesson thinking that the reason we get sick is that we get fevers, it would be a problem. Similarly, students should not come away from a taxonomy lesson thinking that the reason an oak is an oak is that it has acorns. (2) When classifying hardware, all classification schemes the students come up with will be equally valid—but the same is not true in biology. Biologists are looking for the classification scheme that reflects the true evolutionary history of the organisms. Since hardware is designed (i.e., it did not evolve), there is no basis for saying that one classification scheme is better than another. This is completely different from the situation in biology, where biologists gather masses of evidence to figure out how an organism fits into the tree of life and may argue strenuously about it. Sorting activities involving human-made objects may end up suggesting to students that biological classification is fairly arbitrary, when, in fact, the opposite is true. The author wishes to thank Brent Mishler for helpful conversations and Judy Scotchmoor for comments on an earlier draft. Angielczyck K. Dimetrodon is not a dinosaur: using tree thinking to understand the ancient relatives of mammals and their evolution. Evo Edu Outreach 2009;2. doi: 10.1007/s12052-009-0117-4. Chiappe LM. Downsized dinosaurs: the evolutionary transition to modern birds. Evo Edu Outreach 2009;2. doi: 10.1007/s12052-009-0133-4. Clack JA. The fish-tetrapod transition: new fossils and interpretations. Evo Edu Outreach 2009;2. doi: 10.1007/s12052-009-0119-2. Prothero, DR. Evolutionary transitions in the fossil record of terrestrial hoofed mammals. Evo Edu Outreach 2009;2. doi: 10.1007/s12052-009-0136-1.